Spoken while staring into a mirror with his wife standing behind him. My dear Uncle Red was trying to figure out how he was going to explain the duck, the ruined camera, and all his wet clothes and shoes ruined by an unexpected dip in the pond. And that is exactly what is swimming around in my head today. Yep, the holidays are coming, and as much as I love them, they are hectic and crazy, and every year I think it might kill me. My friends always ask me how to you get it all done? The truth is I have no idea. I am the only cook in the family that lives nearby so if I want my boys to experience good old fashioned cooking the ball is in my court. And as God as my witness, those boys are going to have good home cooking every single Christmas until I am too old to lift a pot. In life, you have to choose what is important to you, and this is important to me. So today I am going to make a list. These will require more than index cards or post-it notes. I need to break out the big guns. Here is what I use to unload my brain to get ready for late fall and winter events. My super size purple lined pad. Its not legal size but standard and I so love the pretty purple color. Lame, but who cares as long as it motivates me. And its is much roomier than an index card. And most importantly a cleared off the desk with an empty physical inbox. The GTD cards are a must. I have been a GTD follower for a couple of years now. And although I am not an SUPER-GTD follower, I am a very thankful one. Process the stuff into projects, tasks, or file it away for a rainy day, just in case, or a momma memory file. Review, plan, bums and elbows ( DO), this just means planning, scheduling for how and when all the things that need getting done will get done. The GTD cards are like little cheat notes to refer to when you are in a slump. I usually keep my right on my magnetic board. But some little elf has run off with them. If you are new to the term GTD, GTD is a method developed by “get it done guru,” David Allen. If you want to learn about the method read this book, Getting Things Done The Art of Stress-Free Productivity. I have heard him speak on two occasions and I must tell you the man in person is worth every penny. He is engaging and speaks as if he has been hanging out in your office (home office) all week long taking notes on how you get through your day. 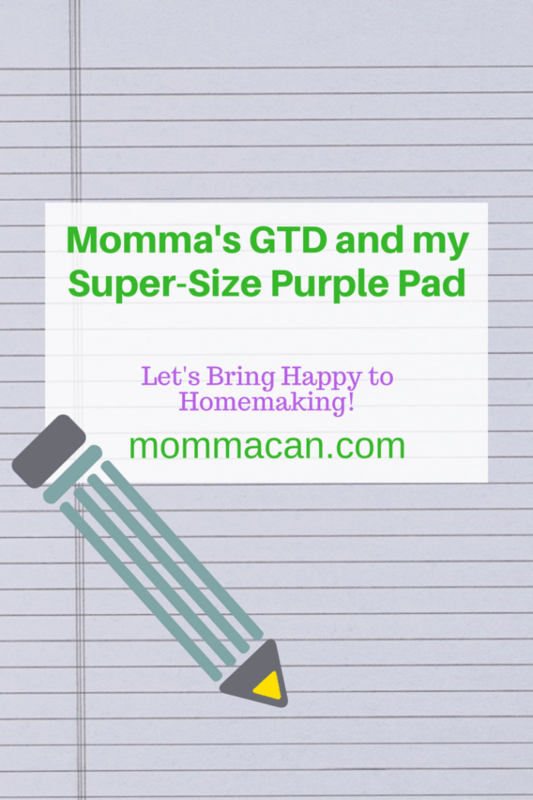 My personal favorite as a WAHM or SAHM is the Getting Things Done Audio CD. When I first purchased the collection I would sneak off for a” grocery shopping trip” just to listen. Sometimes I would laugh at what he said and sometimes I would weep a little because it was so darn accurate. These are all the tools I will need to be listed about to unload my brain before the games begin. This first thing I am gong to do is to write down all my biggest projects that are due in the next three months on my funky, fantastic, awesome purple lined pad. And that is enough and all I have time for during the day. My planning for the holidays is broken down into doable bites. The Stuff is a pretty broad term used way too much I know, but these will be broken down in the next day or two. So that is it in a little bit bigger nutshell than I expected. Just writing this down has made me feel a bit better. So my kind of simple challenge for you today is, please write down all of you projects. Large and small, Short and Tall, they all need to be written down. Hi, Love your posts on GTD. You mentioned a SAHM or WAHM CD from David allen. Can you tell me where to find that? I’ve been GTDing since 2005. I’m a new mother of twins, and want to incorporate my system to my new home life. Thanks so much for your help. Here is a link Maya.